Elf on the Shelf is such a popular tradition with children these days. The tradition as we know it now wasn’t around when my girls were little (or if it was I didn’t know about it). I have wanted to do it for a few years but obviously I don’t have little kids around. But this year, I decided that Bronco the Elf was going to visit Aunt Deanna’s house every morning and I would take a picture and send it to my niece to show my great-nephews. Bronco the Elf is a little different at Aunt Deanna’s house. He doesn’t tell on you if you have been bad. He just shows up in fun places doing funny things! 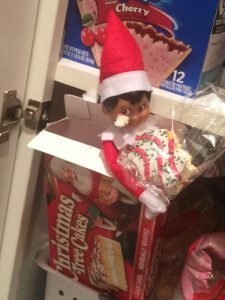 This morning Bronco was in the pantry and had eaten the last Christmas snack cake and had evidence all over his face. Another day Bronco was stuck in the dog treat canister. 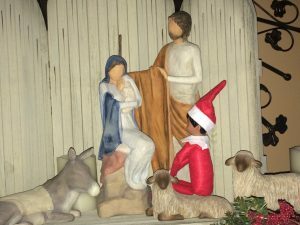 And another day Bronco was sitting on the sheep in the nativity scene in awe of the baby Jesus. I have had a great time with Bronco the Elf. My nephews (and even my adult girls) wait in anticipation of the picture showing where Bronco will show up each morning. Man, if only we would be as excited to see where God will show up each day! If only we would wait with anticipation and excitement to see how He is going to work and to look for Him everywhere we go! He’s with us every day and working “behind the scenes”. We just have to be aware and look for His works and wait in anticipation. I’m getting excited to see where God is going to show up today!! Who knows…. maybe He will need a Christmas snack cake, too! May your day be filled with excitement and anticipation! 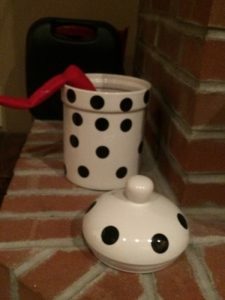 This entry was posted in devotional, Elf on the Shelf, inspirational, motivational, spiritual, Uncategorized on December 2, 2016 by Deanna Young.